A few years back, Neela Bhattacharya Saxena undertook a journey to find the Mother God of the West. Her guiding questions were, if the Mother God does exist, to what extent is she suppressed by patriarchal monotheisms and can we still find traces of her in the lands where she held sway in ancient times? And is she indeed connected to Kali that this sojourner had grown up with? In her quest, Saxena uncovers layers of philosophical, cultural, and gendered suppressions of the female god to reveal a vibrant layer of the Mother God in the western world. 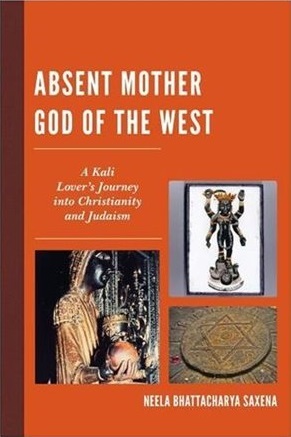 Needless to say, this journey that is not merely a philosophical quest, but one that emerges out of a soul connection to the Divine Feminine, manifests into this beautiful book, Absent Mother God of the West. Saxena traces the history of scholarship on feminist theology of Rosemary Reuther and others, inquiring and exploring the women-centered traditions that were later dominated by patriarchal Christianity and Judaism. In this process, her journey reveals the feminist underbelly of her research. Her work is not merely a scholarly exploration but is her spiritual longing to give voice to a Tantric-powered ecofeminism / gynocentric feminism. She described Mother God as an “endarkment,” black, luminous and immanent, that she traces in her travels to ancient ruins and churches that are not mainstream tourist destinations. Similar to other female spiritual questers like China Galland and Jean Bolen, Saxena travels alone, “challenging stereotypes of women needing to be protected.” In Greece, Poland, and Turkey, she wonders: How does this Divine Feminine present herself in different forms despite patriarchal culture? How does she establish her plurality despite a common belief in a singular God? How does she still appear in phenomena when the prevailing patriarchal faiths balk at image making? These persistent questions underlie the book as Saxena stumbles upon the Divine Feminine in Cyprus and Greece, revealed to her in synchronicities and liminal states as she continues her journey. She observes, “patriarchal monotheism has been constructed against the feminized body / flesh / matter.” The Demeter-Persephone, Innana and Annat stories become real as she travels the road of the pilgrims in Greece, Crete and Turkey. And in every story of this traveler, we catch glimpses of Kali and the Black Madonna, informing us that feminine energy is circular, alive and pervasive—she is the earth we walk on, the leaves brushing against our skin, trees offering shelter, the wind that caresses our tired bodies, our salt tears that wet our lips. We see how we are embraced by our mystical experiences as soon as we open our hearts and listen to the still music. Like the serpent that bites its own tail, Saxena comes full swing back to the feet of Kali, the terrifying and compassionate Mother God that absorbs everything and her “pregnant nothingness” rebirths us as we step closer to her and into her. Non duality is what she is, “all distinctions [are] dissolved” (Galland, qtd. in xix). She describes this nondual notion and the idea of immanence in Western philosophers, such as Spinoza, Nietzsche, Derrida and the French feminists. So it is not surprising when she discusses, with the help of Raphael Patai and the Kabbalists, the viability of the Shekinah (whom Gershom-Scholem compares to Shakti) in Jewish mystical thought. Saxena lays the foundation of her research in her description of Indic dharmas and Kali’s place in it, how the plurality of faiths directs us to a plurality of texts, how multilayered traditions show us the validity of praxis and relaxed dogma, the different aspects of energy that multiple goddesses embody. She inquires into shunyata, foundational to Tantric and Buddhist philosophies, all in a personal and philosophical vein imaged in Kali whom she calls “pregnant nothingness.” As a practitioner of Shakti (goddess) worship, her philosophical explanations become concrete and imagistic. She shows how goddesses “are available to the common mind,” thus bringing her audience right to the present moment of feminism—showing women that they are inherently powerful, that their potential is unlimited despite being situated in any patriarchal culture around the globe. Emptiness—emptying oneself of ideologies and assumptions, to grasp reality as it is, acquiring clarity, spontaneous flow of karuna/compassion toward all so no distinctions are made. Woman is embodied with shunyata, asserts Saxena, echoing Buddhist and Tantric thought. 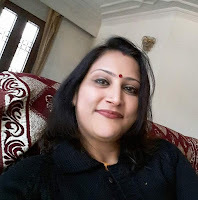 Although this is available to all, woman has a higher potential “if she aspires to achieve wisdom.” Saxena wanders into a strange land, (the land of a “constructed” monotheism), empty of assumptions and is greeted by serendipitous meetings and revelations. Strangers aid her to reach her goal. Wandering, discovery, connection to nature, intuitive understanding of the present, the feminine core common to cultures, transformation in phenomena, concrete expressions of the numinous, these are the various themes underlying this work. Carving this Indo-Buddhist positionality, Saxena enters Abrahamic faiths to reveal that the Mother God is very much present in these religions, although suppressed by monotheism, which itself “is a myth, a construction that not everyone in its fold accepted.” Although serpents, female figures, and icons are seen by Western monotheistic religions as sacrilegious, they nevertheless surface even today in the center of these faiths in some of the cultures, or in the margins, or the subterranean depths of Western cultures in new-fangled cults and new age spiritualities, or in ancient beliefs such as Wicca. Although it would have been helpful to have a glossary of Sanskrit words to help us with some of the more difficult passages dealing with Tantra, we are invited to participate in a pilgrimage that is described in limpid prose, mostly free of jargon. Saxena is gifted in being able to bring a wealth of diverse philosophical ideas in easy conversation with each other. This book is one that we can dip into again and again and find our intellectual, creative and spiritual faculties sharpened.